I've been painting postcards. 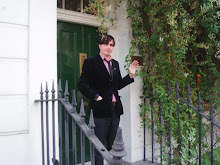 For reasons I explain HERE on the first blog which was London. I've also painted postcards for NOTTINGHAM, NORWICH and BRISTOL. They have all been sold. Leeds was the fifth show of the UK tour and for this one we had Internet Forever with us instead of the Lovely Eggs. Despite Internet Forever being brilliant, I did miss the Lovely Eggs a little bit. Mainly because I'd spent most of the night before drinking and playing table football with them and wanted a rematch because I'd lost. After our show at the Thekla we'd gone to a place called the Lanes to watch Tender Trap. Which is where I was beaten by The Lovely Eggs at table football. My friend Matt Biscuit from The Art Goblins had also come out for the evening and he beat me at bowling. Now I shouldn't have really been bowling as I had a bad back. I was full of booze though and felt invincible. The next day waking up in the Bristol hotel room I could barely walk. I was bent double, I looked like a question mark. I was terrified that we wouldn't be able to play the show in Leeds. It took me nearly an hour to get dressed and then Dyan had to carry me out to the van. I'd suffered from a bad back like this before and knew that it usually gets worse before it gets better. Instead of sitting in one of the vans seats I lay completely flat on my back on the floor for the entire trip to Leeds. Leeds is quite a long way from Bristol so we stopped at a service station half way for lunch.It took me ages to climb out of the van. In the end I had to slide out slowly on my back with my groin raised high in the air. I slowly inched my way out with my three piece suit riding up around my waist, swearing loudly to myself and laughing at the ridiculousness of the situation. It wasn't till I'd managed to get out of the van that I noticed that in the car parked directly next to us there was a family eating sandwiches staring in at me. I'm suprised they didn't phone the police. I thought about painting me sliding out of the van on my back for the postcard as a kind of play on the way female popstars have to learn how to get out of limousines in short dresses. The image is still too painful for me though and would look more than a little vulgar. 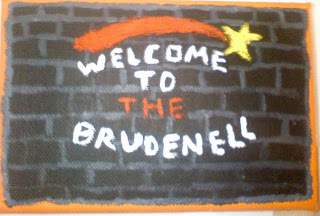 Anyway we got to the Brudenell Social club fine. I was suprised as it turned out to be a proper social club with tables and seating. The sort that I used to go to with my grandad. Its an amazing venue. Luckily as I do a lot less jumping and kicking in EITFR...N then I do in Art Brut, I managed to play the show. Although with we me hanging off the microphone stand and everybody sitting down at tables it did give it a kind of cabaret feel. From my experience with my back, I knew it was only going to get worse and was worried about the next show in Manchester. The promoter gave me something though that cured my back and saved the show in Manchester. I'll paint it for the Manchester postcard. 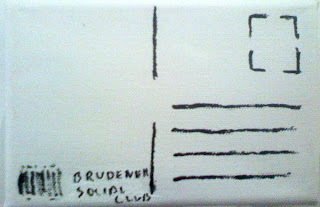 My Leeds postcard is made of two 4"x6" 100% cotton canvases, acrylic paint and sharpie pen. It costs £35. If you buy it I will fill the back in with pen and add a stamp that I have also made. I will post it to you in a proper envelope though.